Drilling phase of st1 Deep Heat project completed, stimulation in a few days! 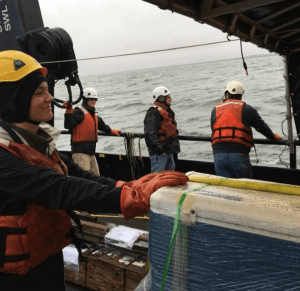 After two exhilarating weeks of collecting heat flow and temperature data on the Beaufort Sea, we finally saw some land and successfully ported in Nome, Alaska on Monday September 26th, 2016. Our journey let us behold sights we had never seen before, such as a mother polar bear and her cubs, sea ice in all shapes and sizes, and the Northern Lights, though the first sight of land in two weeks had to rank near the top. 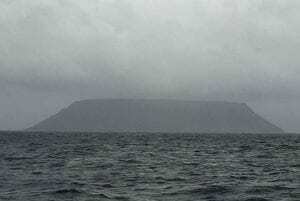 The sighting was of Sledge Island, Alaska, a primitive piece of land covered in clouds located west of Nome, AK along the Bering Strait. After the surreal sighting of Sledge Island we safely pulled into the harbor of Nome, AK, a truly frontier town and our first piece of solid ground in 14 days. Making sure our onboard equipment was properly stowed and accounted before disembarking was a key and mission critical task and once completed we safely stepped foot on dry land, and step foot we did. The mysterious Sledge Island, AK, our first sighting of land in 2 weeks. Waiting to pull into to the harbor at Nome, AK. Fighting our sea legs, the researcher team explored Nome on Monday night and Tuesday morning before our homeward flights, enjoying the local fare and sights Nome had to offer. The history of Nome rivals that of any major city in the lower 48 states, with its gold rush and the classic shipment of diphtheria serum by dog sled in the beginning of the 20th century, which led to some very interesting and rightly deserved monuments throughout the town. After our exploration of Nome, we made sure all of our equipment and bags were in order and we headed off to the airport to head home. All in all the trip was fantastic, with numerous heat flow data points collected in the Arctic Ocean and everyone remaining safe and sound, we were happy to be headed back home. 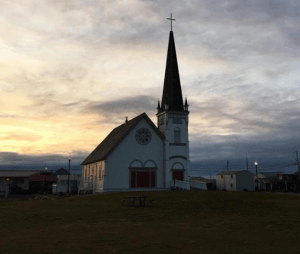 Old Saint Joseph’s Church in Nome, AK at sunrise. One of the oldest buildings in Nome (1901) the church would light up at night in order to guide in wayward land travelers during the gold rush. For more information on SMU Geothermal Lab research, check our website.